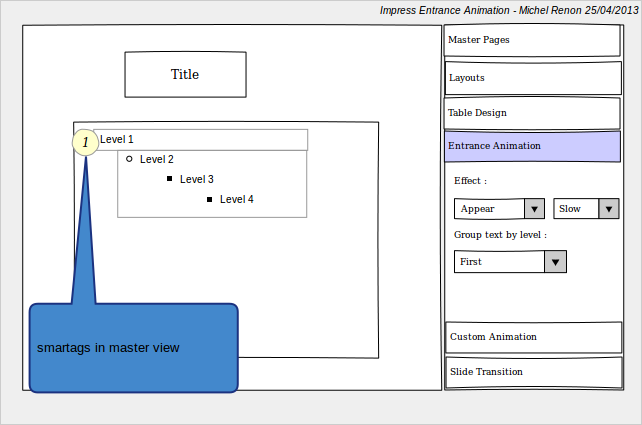 Design proposal of an easy way to define Entrance Animation for Impress. 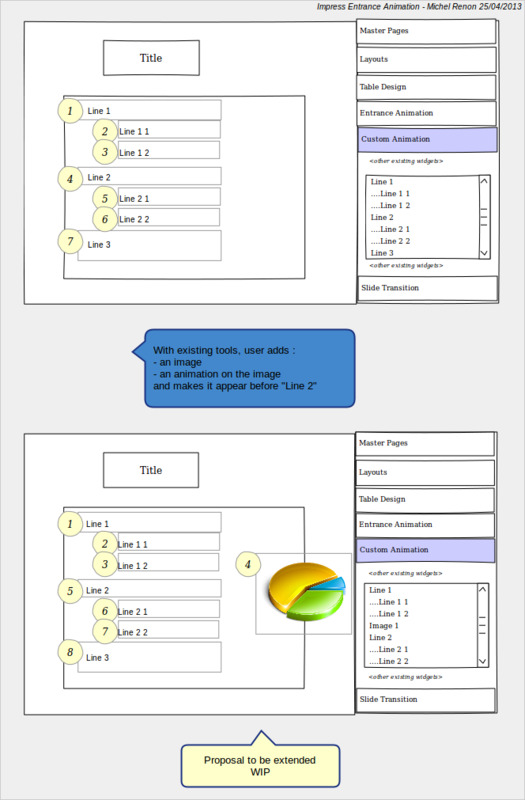 This is a work related to bug #41572 "Please make it possible to add custom animations to master slides" (tdf#41572) and the thread (https://lists.freedesktop.org/archives/libreoffice-ux-advise/2013-March/001876.html). I extended the initial question to : "how make it easier to create entrance animation ?" as it is the one of the example given for the bug. 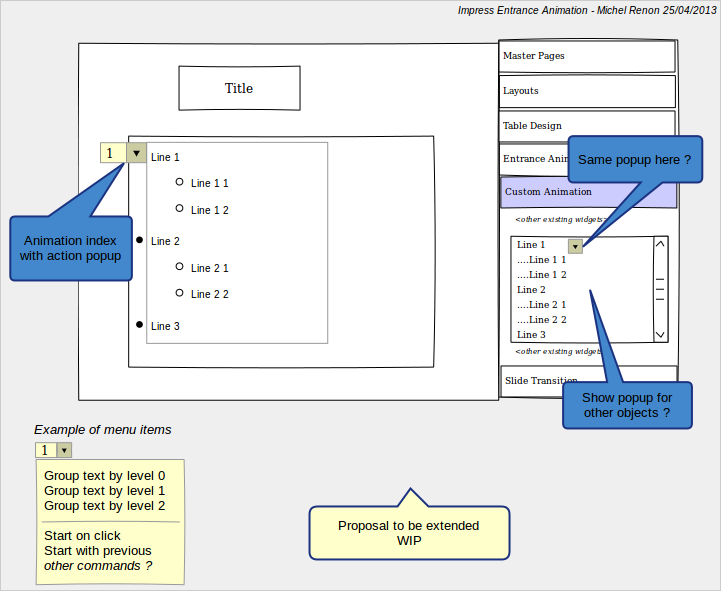 User is working on a existing slideshow ('exemple.odp'). 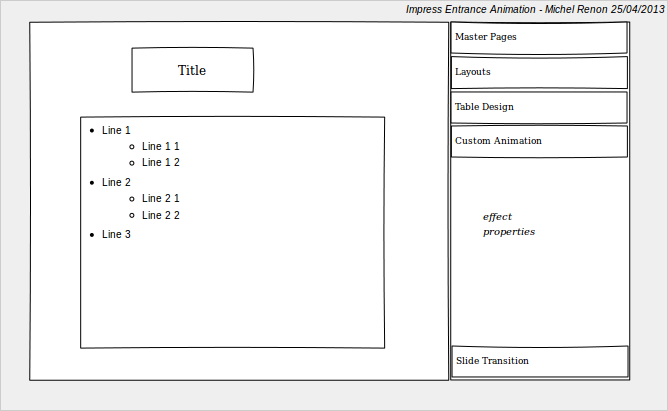 In slide 2, he wants to add some entrance animation on the content textfield : each line (first level) must appear on click. Finally he decides that each line (second level) must appear on click. User wants to create a new slideshow. 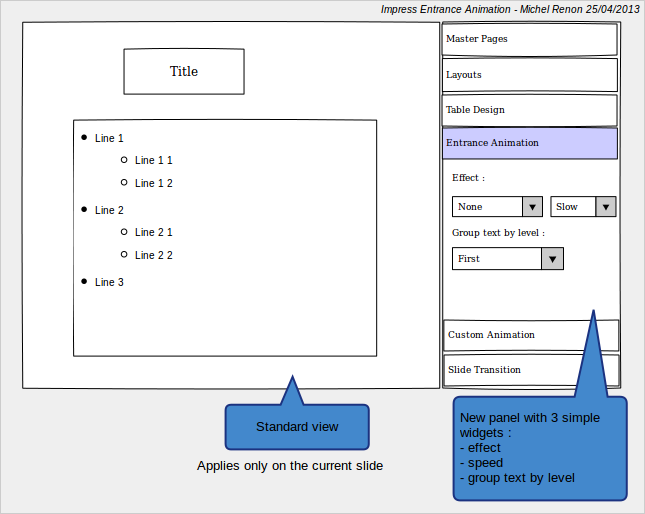 Each slide must have an entrance animation on the content textfield : each line (second level) must appear on click. He wants to define that animation only one time in the master slide. Using file 'exemple.odp', user wants to add an image in the slide 2 and make it appear before the line "Line 2" of content text field. User creates a new odp file. 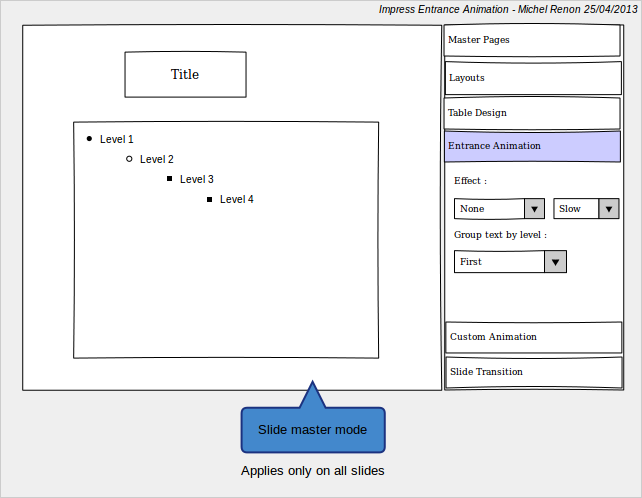 In master view, he creates an Entrance animation for all slides (Group by level 1). In slide 4, he changes the Entrance animation, by grouping text by level 3 (this slide has 3 levels of text). Then he goes into master view and changes the Entrance animation : group text by level 2. What should happen for slide 4 ? 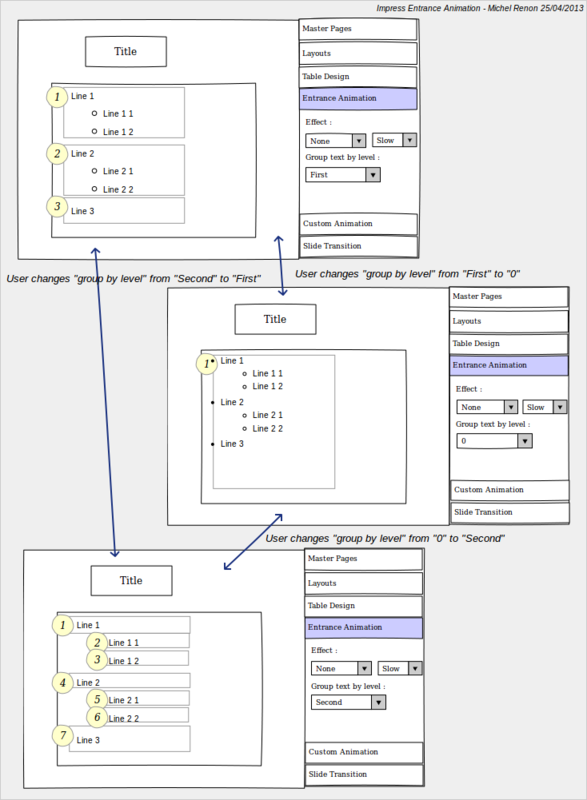 This example is for field "group text by level", but it's similar for all fields that can be defined in the master view. I suppose that slide 2 is already opened, and that "Layouts" panel is opened. 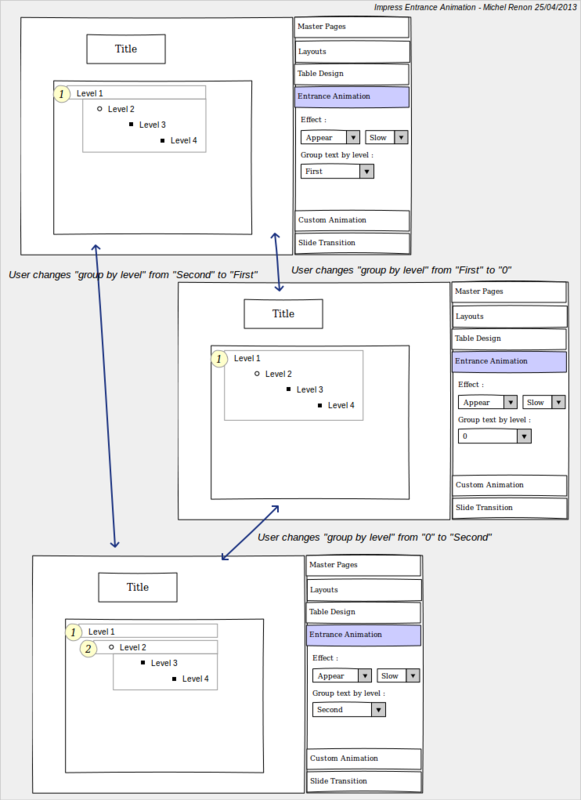 we see that the option "Group text" of the first object in the list is "By 2nd level paragraphs"
I found no way to group automatically or semi-automatically the whole textfield by level 2.
ie changing the option "Group text" of the first object in the list has no effect. User has to re-create animation for each slide. I suppose the image has been inserted in the slide and that the "Layout" paneil is opened. 4 clicks on up arrow ("Change Order") to make it appear before "Line 2"
Q : Is it possible to implement some visual changes on objects in slides ? ex : add some small widget beside (or inside?) an object to indicate a status or to show a popup to activate some changes. Or have a special border. These widgets/borders would be shown via a menu command, or via amouse hover, only while designing the slide. A : Yes, that is possible - there's a concept called SmartTag in Impress, that is e.g. used to implement this four-way icon at the presentation placeholder objects ('insert table/chart/picture/movie'), or for editing motion path animations. So the base technology for that is there. Q : Is it possible to implement some visual changes on every single line/ some lines of a textfield ? It's a detailed version of the previous point : can a line in a textfield have some widget ? or be drawn with some special border ? A : In general yes, though slightly more involved. Q : today, the 'animation objects' are linked to object in slides, but is the reverse also true ? ie if user modify a slide object, can the animation object be updated automatically ? A : Not sure I get the idea - are you referring to changes e.g. to master pages, that then translate to all slides using it (that is one aspect of the original question / task Janit was looking into)? Q : No, I was referring to the edition of a slide, when an animation is already defined on the lines of text : if you change the content of the text, the animation is not updated. A : Right - this is a bug. A : This one. ~All the work needed is in sd. Q : In this whole subject, what objects are linked to ODF format ? A : From the above - nothing should affect the file format. 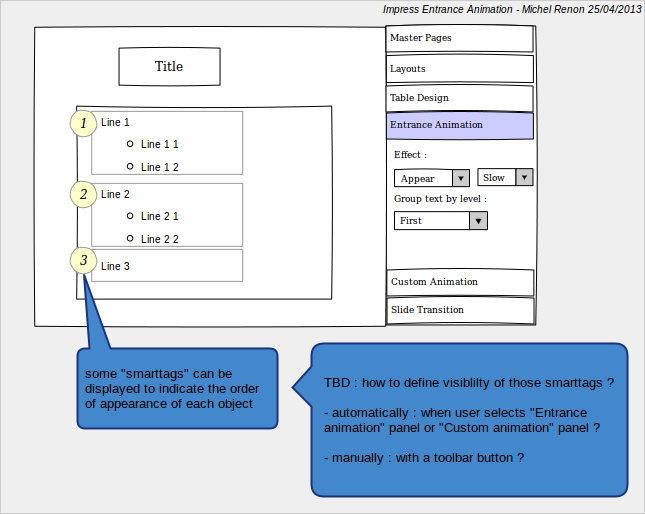 Q : what are the technical limitations related to animations in Impress ? A : Going back to my initial comment - the sky is the limit. Without concrete questions though, hard to answer specifically. The idea is to add a new task panel with simplified widgets (3 popups) that allow changes with very few clicks. In master view, the border should be specific because there is no real content. Otherwise, border for "level 0 group" may be identical to "level 1 group"
I suppose that Master view is already opened, and that "Layouts" panel is opened. No changes in nb of click from current behavior. The only change may be visual : the image has a smarttag. add a popup menu with commands. It may provide shorcuts to enhance use case 3. This page was last edited 11:42:33, 2018-06-19 by Dennis Roczek. Based on work by Lera Goncharuk and Robinson Tryon and others.